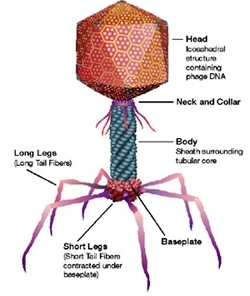 Bacteriophages or bacterial viruses are viruses that parasitize bacteria. The first two scientists to observe bacteriophages were Frederic Twort of England and Felix d’Herelle of France. The term bacteriophages (eaters of bacteria) was coined by d’ Herelle. Bacteriophages fall into four major groups based on the genetic material they possess. T4 phage is the most widely studied. Let us take T4 phage as an example to explain the structure of the DNA phage. T4 coli phage that attacks intestinal E.coli has 5 parts. Head is prism like hexagonal having length 950 A0 and breadth 650 A0,tail is also 950 A0 in length, joined to head by neck and collar, tail is having hollow core of 80 A0 and is surrounded by tail sheath. It consists of ds DNA core surrounded by protein coat called capsid which is formed of ~ 2000 capsomeres. Tail: is the narrow cylindrical part. It has central hollow core or tube through which viral DNA is injected into the host. The core is surrounded by sheath proteins. Base plate: is the hexagonal plate with tail fibres, usually 6 in number and used for attachment to the host cell wall during infection. Tail fibres can recognize specific receptor sites in the host cell wall.